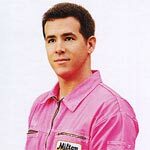 Jerry (RYAN REYNOLDS) is that chipper guy clocking the nine-to-five at a bathtub factory, with the offbeat charm of anyone who could use a few friends. With the help of his court-appointed psychiatrist, he pursues his office crush (GEMMA ARTERTON). However, the relationship takes a sudden, murderous takes a sudden, murderous turn after she stands him up for a date. Guided by his evil talking cat and benevolent talking dog (both voiced by Reynolds), Jerry must decide whether to keep striving for normalcy, or indulge in a much more sinister path. This release comes with a matted slip cover. Inside is a redemption code for the UltraViolet Digital HD. The Voices: From Fridge to Frame (16:54; HD) is a behind-the-scenes featurette and includes on-set interviews with the cast (including Ryan Reynolds, Gemma Arterton, Anna Kendrick) and crew (director and producers). It’s pretty basic but gives some limited background on the project. VFX: The Making of Bosco & Mr. Whiskers (6:34; HD) looks at how filmmakers brought talking cat and dog to life. VFX: Comparison Showreel (2:55; HD) is a short feature showing how certain visual effects elements were accomplished. 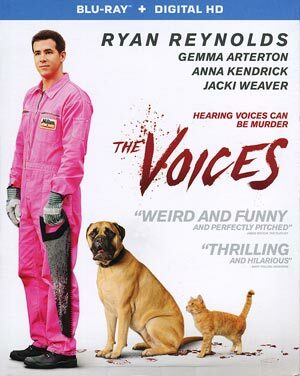 The Voices of Ryan Reynolds (4:31; HD) here we get the recording sessions with Reynolds as the cat and dog. Deleted Scenes (12:10; HD) and Extended Scenes (4:24; HD) include several scenes that were removed or cut down for various reasons, probably for pacing issues. Last up are some Animatics and Cast & Costume Sketch Gallery. The Voices slashes its way onto Blu-ray presented with a 2.35 widescreen aspect ratio and a 1080p high-definition transfer (AVC codec). The picture itself is pretty clean since in all likelihood it was shot digitally. There are no obvious signs of pixilation or aliasing and colors appear to be well balanced throughout where skin tones look natural though considering the material, the film has a darker look to it so it’s not quite a brilliant transfer, when we do get colors, such as the pinks in the uniforms, they do come through vividly. The disc comes with a standard DTS-HD Master Audio 5.1 track which provides for crisp and clear dialogue levels and although there’s really not depth the front and rear channels do get some use for ambient noises as well as the soundtrack which features some choice music. 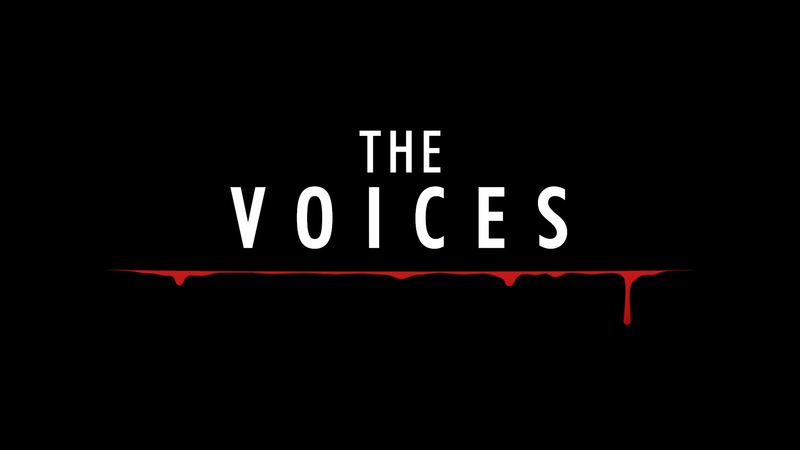 Overall, The Voices is certainly not a movie for everybody. The film is as dark of a comedy that has come down the pike in some time yet it further shows that Ryan Reynolds is actually a fairly versatile actor it’s just that the choice of certain projects hasn’t been the best (see: Green Lantern, R.I.P.D.). If you were a fan of “Dexter”, at least its early years, then this might be worth checking out if only as a Red Box rental.